Michael J. Nelson is the former host and writer of the Emmy-nominated, Peabody Award-winning Mystery Science Theater 3000. Since that time, he has appeared on numerous radio and TV shows, penned a regular column for TV Guide, and authored best-selling books for both HarperCollins and Abrams. Kevin Murphy has cultivated the act of talking back to the movies into an art form and a career. 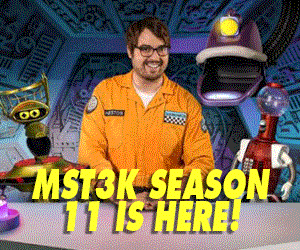 For ten years Kevin co-wrote and directed the Peabody Award-winning series Mystery Science Theater 3000, and starred as the plucky red robot Tom Servo. David has been working in the production field for over 20 years. He started working at age 14 as a freelance computer specialist and monkey trainer. Later he worked as a Jr. Professor at the Hereshire School for Monkey Behavior Modification. "Weird Al" Yankovic, the undisputed king of pop culture parody, has sold more comedy recordings than any other artist in history. In a career spanning nearly three decades, he has amassed 28 Gold and Platinum albums, 7 Gold and Platinum-certified home videos and 3 Grammy Awards (with 9 nominations). 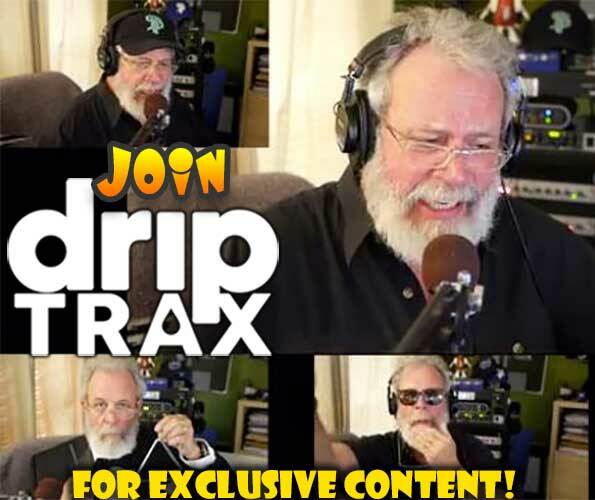 DisembAudio is the world famous synthesized voice behind RiffTrax's Patented "Perfect Synch Technology." He has long been a player in the world of synthesized voices, and has worked in all areas of the industry. Born and raised in Shaker Heights, OH, Willard began his career by spending a year at Chicago's famed Second City. Performed with Mike on Willy Wonka and the Chocolate Factory now hosting the Oscars! Coincidence? Bridget Jones Nelson was a writer and performer on Mystery Science Theater 3000 playing such roles as Nuvenna: Woman of the future, Drunk Girl, Lisa Loeb, Flavia Roman Princess and Mr. B Natural. Mary Jo Pehl is a former writer and villain on Mystery Science Theater 3000. In addition to playing the evil nemesis Pearl Forrester, she also played an array of bit parts, including a space mom, an overly-friendly neighbor, a trailer trash party girl, and Jan-In-The-Pan, a head without a body. Conor Lastowka is a Senior Writer-Producer who has worked at RiffTrax since day one. 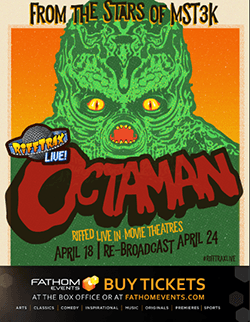 He performs as the voice of DisembAudio on RiffTrax MP3s and you've seen him onstage at the MST3K Reunion Live Show. Rich "Lowtax" Kyanka runs a website. This website is on the internet. It is called "Something Awful" and you may access this website by typing www.somethingawful.com in whatever device you typically use to accomplish internet-related tasks. Matthew J Elliott is a British writer and performer who lives in the town that spawned Georgie Fame, author of Lost Horizon James Hilton, Colin “Chariots of Fire” Welland (his actual middle names, believe it or not), and, apparently, the guy who invented the Spinning Jenny during the Industrial Revolution, but never thought to patent it. Josh Way is a cartoonist and writer from New York. His daily comics strip “Chronicle” can be found online at http://chroniclecomic.com. Introducing Incognito Cinema Warriors XP, an all new riffing show that makes watching bad movies a breeze. Riff Raff Theater is crowdsourced comedy! Chris Hanel, Todd Gutknecht and Danuuc combine their comedic stylings with a heaping helping of Web 2.0 ingenuity. Riff Raff's performances are written with the assistance of fans, bringing together all who are willing to get in on the action. Join in and win prizes and get free riffs! Janet Varney is a comedian, actor, writer and producer. In the animation world, she is lucky enough to be the voice of Korra on Nickelodeon's hit series The Legend of Korra, and she can currently be seen as Becca on the live action FX series You’re The Worst. Cole Stratton wears a lot of hats. Not literal ones, as he has a tiny head and it just doesn't look right. He is the co-founder of SF Sketchfest, the San Francisco Comedy Festival, a month-long annual event highlighting the best in improv, sketch, stand-up, TV and film comedy. Greg Duffy and Jim Duffy are the minds behind the Atomic Soda Pop Gang. - Greg is a director, graphic artist, editor, and developer of irregular concepts. He loves long walks on the beach, the fragrance of a lush forest, and the frenzied lilt of a good Rob Zombie tune. An independent musician with the heart of a geek, Jonathan Coulton left his day-job as a computer programmer to stay home and write songs. Paul Sabourin and Greg "Storm" DiCostanzo grew up in the suburbs in the '70s and '80s, which explains a lot. Eventually, after a lot of boring stuff, the two met and helped found the Washington, DC-based a cappella band Da Vinci's Notebook, becoming the group's main songwriting team. Matt Sloan and Aaron Yonda are best known for their video series Chad Vader, a viral internet sensation that has received over 25 million internet downloads and counting (view it on YouTube). Chad Vader has won over a dozen film festival awards, including the "George Lucas Selects" award from the 2007 Star Wars Fan Movie Challenge. Veronica is the co-host of Revision3’s tech-centric show, Tekzilla, and Qore on the PlayStation Network. Previous to that, she hosted several other online video shows and podcasts, including Mahalo Daily, Buzz Out Loud, MP3 Insider, and Crave. She also created tech video content for CNET TV, including the popular series Prizefight. While not a man of a million voices, Jason Stephens is capable of approximately 30 distinct impersonations; Morgan Freeman, Christopher Walken, John Madden, Sean Connery, Mr. T, Nicolas Cage and Gilbert Gottfried among those which actually sound like the individual in question. Paul F. Tompkins is from Philadelphia, PA, where he started performing stand-up comedy in 1986. In 1994, he moved to Hollywood, CA, which led Paul to a stint as a writer and performer on HBO’s MR. SHOW WITH BOB AND DAVID where he was nominated for an Emmy award for writing. Ian Potter is a writer, performer, sound designer and occasional table. He was born in England, in an obscure coastal town called Liverpool. He is almost certainly the most famous person ever to have lived there. Mike Schuster is a professional comedy professional, slinging jokes and trivia slides as a RiffTrax contributing writer since 2013.